Wow! Does this stuff work. New York City is experiencing a resurgence in bedbugs due to people traveling all over the place, and I found the tell-tale bites on my legs. Yikes! I saved myself over $200 from the local pest control "consultation" by contacting Do My Own Pest Control. They were helpful, and within days I had my first shipment of Steri-Fab. The treatment is simple, effective, and best of all-NO odor. Using this product is as simple as cleaning your bedroom-dust, take the pictures off the wall, strip the mattress, and spritz away! I haven't had a bite in over three weeks and there is no residue or after-smell. Now I can just vacuum, dust a bit, and everything is clean and good to go! This is a great product and a fabulous website. Everyone loves a good buffet, but with Steri-Fab, you don't have to be one, LOL. Thanks again! When I found bed bugs, I promptly bought box spring covers and the mattress covers and washed all sheets and pillows in hot water. Unfortunately, bed bugs are not limited to beds. And in the days since I had discovered them, they had moved to my sofa, as well. 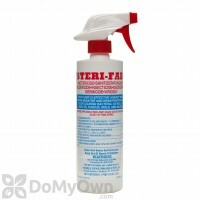 I ordered Steri-Fab and www.DoMyOwnPestControl.com shipped it immediately. I sprayed the sofa, area rugs, and the bed frame itself. Seven days later, I repeated the process. Not a single bite since. I am always going to keep some Steri-Fab on hand now, just in case. Have used this product one time so far and it seems to work very well, did have a strong alcohol smell, we left the apartment after we sprayed and when we returned 6 hours later the smell was completely gone. Haven't seen any bed bugs on the couch or chair, we will spray again in about 3 weeks to make sure the bugs are gone. Didn't stain the couch fabric. I was getting bites overnight but I wasn't sure if it was fleas from my dog or bed bugs. I had never had bedbugs before and thought I might have brought them home with me from a trip to the cabins. I finally decided to search for something online to help treat this issue when I came across this product. I ordered it and used it all over my bed/mattress and floor. I stopped getting bites! It worked great. I had to do it again a week later though. I got one new bite the following week and remembered that the instructions did recommend re-spraying a week later. So far so good! I was desperate to find a solution for my daughter's bed bug problem. She was in the dorm and could hardly sleep waking up with bug bites or feeling them crawling on her at night. I found your website and after reading the reviews sent her the 160z bottle. It worked! I then ordered the larger size and the organic product. That helped her to sleep and finally finish the school year. I appreciated the fact that you had an MSDS so I was able to read about the product prior to ordering. You were great with shipping and delivery. I will definitely recommend your company to my friends. I had pulled down a birds nest in an outside storage area and got bird mites all over me. My husband and I cannot prove that the problem was bird mites because they are microscopic. Not knowing what I was dealing with until I had gone in the house, we got them in our sofa and two lounge chairs. I battled them for approximately two months with various fumigators and sprays. I was scared we were going to have to destroy those pieces of furniture. My husband did not get bitten nor did he feel them crawling on him. I read that they can select one host. Wow! Unlucky me! To avoid getting them spread into our bedroom, I tried many, many suggestions from an online site. It is a wonder I have skin left. It reached the point that my husband and doctor believed that there were no longer any mites, that I had developed a psychosis. I, however, knew better and came across your site. Praise God! I ordered the small bottle of spray and the gallon container. I sprayed the three pieces of furniture every day and also vacuumed the furniture every day for probably two or three weeks. No more mites crawling on me nor nibbling. Because larvae can continue to hatch if not eradicated, I am still vacuuming almost every day and spraying the furniture every two to three days. I praise this product. If I feel anything that even remotely makes me think of a mite, I vacuum that furniture and spray it well. Thank you to your company. I have a prescription for medication to help me get over the "feeling" of having mites on me which I never had to take. I knew I was dealing with the real thing and it was an ordeal that Steri-Fab has helped resolve. I strongly recommend it. While over 60% "isopropyl" (rubbing alcohol), Steri-Fab is an institutional cleaner that ACTUALLY kills bed bugs on contact. Traditional over-the-counter sprays do not do that. Before purchasing, I read reviews on Amazon that swear by it. One person had a bedbug problem for 2 years, spent $1,000s on pest control companies then starting using Steri-Fab for a few weeks and the problem began to disappear. We have certainly seen improvement, and using Steri-Fab in conjunction with Suspend SC and a Insect Growth Regulator (IGR) is eradicating the problem so far, but we are not completely out of the woods as of yet. Looking forward to reporting once complete control has been attained. I tried this for couple of weeks along with daily vacuum of carpet and all bugs disappeared within two weeks. Great product. We sprayed our bed, bedframe and base boards down with Steri-Fab and within a day there were no longer any bed bugs in the bedroom. Highly recommend Steri-Fab to anyone frustrated with bed bugs. I purchased Steri-fab for a birdmite problem. I had called in professional exterminators who put down traps and found nothing, but I continued to be bitten several times nightly. I did every other self-extermination step, cleaning, vacuuming, etc. etc. and when they didn't work I ordered the steri-fab. One review said it smelled horribly, but actually it is a pleasant smell, just as a sprayed chemical it did get overpowering as I finished saturating my mattress. I wish I realised I hadn't opened the nozzle far enough from stream to spray, but, hey I really got my mattress impregnated with it and I sprayed the floor, sides of the boxspring, bedframe and upholstered side chair. I opened all the windows (November..bbbrrrr) and it dried in less than half an hour. I then zipped the mattress into a mite proof cover. It has been nine days and I have been bite free!!!!!! I cannot tell you how priceless this is - I was about to go insane! I still have about a third of the bottle left and pray I won't need it again. However, it would be good to have if I stay at at hotel sometime! Thank you, thank you thank you for this product. Thank god!!! Finally!! something that works!!! I am sooo excited about this product!! I can hardly speak!!! I have been dealing with several mite infestations and nothing I bought in the stores never worked!!! This stuff actually kills these little nightmares!!! Oh thank god_ maybe now I can snap out of my depression!!! Reccomend highly!! worth every penny!! now if only I can get them off my skin n hair ill be able to live!!!???? Steri-Fab is a wonder. I used this product along with Bedlam. I didn't have bed bug problem after using them. Would recommend this product to anyone. Another bird mite sufferer using insecticide. For general elimination. But on furniture and bedding this stuff works fast wish I knew about it months ago. good supplemental product.. no excellent product will be buying more.. This product must be good because ever since I tried it I haven't had any trouble. Thank you domyownpestcontrol and the delivery was quick just like the product got my bug out quick. Thank you so if I didn't see any problem this Steri-Fab did the job I'll keep you guys on my contact address good luck. I just completed a 3 week cross country trip, used this product prophylactically in every hotel room and felt much more secure. We needed a shoot-em quick without worrying about staining etc. and this one has worked as we hoped. My friend left me a couch and along with some bed bugs. After doing extensive research online, I decided to go for Steri-Fab and Bedlam. I sprayed Sterifab on the couch,left the couch in cold for 3 days,sprayed again and left in cold for another 3 days.I was surprised to see that all the bed bugs were dead and gone.I also washed all my clothes using 5 caps full of Steri -Fab/load and heat dried them.I am very pleased to say that it has been 2 months and there is not a single trace of bed bug in my house. One of the best products ever. It was a great product and I would recommend it, I had like the worst beg bug situation in my home and especially when you have kids you don't want them around, this product really worked. Originally I purchased this product to treat my luggage after traveling to prevent bedbugs or other vermin from infesting our home. Once the product was in the house I discovered that it is also wonderful for freshening and "fluffing" pillows, mattresses, upholstered furniture and freshening carpet between cleanings. After spraying pillows I place them in a plastic bag for a minimum of ten minutes and then allow to air. Cover mattresses and upholstered furniture and carpet with plastic for a minimum of ten minutes as well. Recently I also used it on the seat belts and upholstery in the vehicles. Just allow time for the item to completely air dry to give the smell time to dissipate. I love this product. I ordered this product because of a bedbug problem in the apartment where I live. Since I started using Steri-Fab I have not seen any or been bitten. This is a great product. I highly recommend it. Thank you. Used 1 gal. on two beds and the couch- no bights first two days then could not sleep in bed to many bights and you could see them- was a total waste of money and time and amount it cost to stay in motel because of strong sbell. Would not by it again. I was anxious to begin using Steri-Fab after we had a steam treatment for bed bugs. The technicians who did our treatment recommended it, and said they used it themselves. I was relieved that it is easy to use and has other disinfectant properties. After the first heavy spray on the mattress and bed frame and baseboards, we let the room air out for about 1/2 hour and did not notice any particular discomfort or problems with the smell. I ordered the refill and have been spraying off and on around the area for a few weeks now -- and So far, so good! No more bugs. Thank you! I purchased this product and they got rid of my bed bugs immediately! I have used this on bed frames, floors, mattresses and between moulding. It works. Do not expect to spray once and be done. It is not designed to have a residual effect. I used Bedlam after Steri-Fab dried because it has a residual effect. Spray at least once a week for a few weeks and your bed bug population will decrease and eventually die out. The result is right at your eyes as you spray the insect. It works great as the label described it. I haven't seen any bedbugs I sprayed crawling away. I wish this insecticide can last longer than 30 minutes. This product evaporates so quick therefore, if any insect hide at the moment you spray then it will come back to multiply. The product worked initially but it seems has it limits in confined areas as the bugs reappeared in a few days again, indicating they can hide or retreat to other rooms or connected houses like row houses. Used this spray on two separate occasions in hotels in NYC and Rochester and did not suffer any bedbug bites. Don't know if the spray killed them or just convinced them to bother someone in another room but I have no complaints, either way. Good stuff. The gallon size is the best value. I sprayed this on an old upholstered chair I bought at an antique mall, to prevent musty odors and also kill any critters that might be lurking. As promised, when after it dried, there is NO smell. I'm pleased and have peace of mind using the chair in my bedroom.